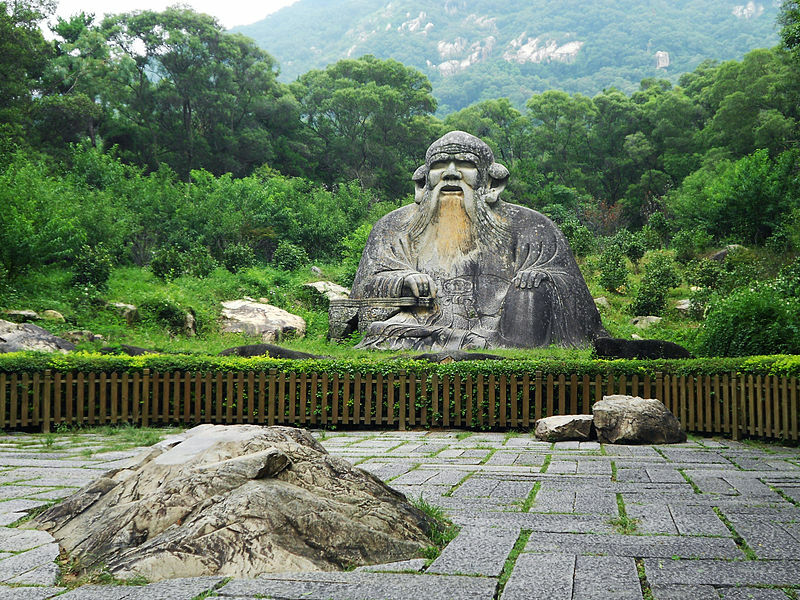 A famous statue of Laozi in Fujian. Source: Wikimedia. Most students of the traditional Chinese martial arts ask few questions about the nature or origins of their practice beyond the myths that all schools seem to pass on as a component of their core identity. Given that these fighting systems focus on embodied ways of knowing, this should not be too much of a surprise. The immediacy of this personal experience is precisely what is attractive to so many seekers. If the past intrudes on their practice it is only as distant stylized echoes. Nevertheless, in each generation there is a small subset of students who are compelled to undertake a more scholarly (or at least systematic) examination of the origins and ultimate meaning of their arts. This can be a discouraging task. At first one may attempt to ascertain which of the competing myths is “true,” or which lineage can advance the most legitimate claims. For most styles it quickly becomes evident that it is almost impossible to trace the actual origins of modern practices beyond the middle of the 19th century. All of the various creation myths turn out to contain a certain degree of self-aggrandizement, nor are the lineage histories ever totally satisfying. The gap between popular “folk history” and modern academic history is just too wide. The surviving (legitimate) historical records are too few to bridge the chasm. At this point the student is left with two options. She can concentrate on more recent periods for which ample data still exists, or one might begin to consider other, more theoretical, questions about the nature of the Chinese martial arts themselves. Given that this pattern of questioning, discovery and disappointment has been playing itself out (with disturbing regularity) since at least the 1920, why does it still surprise us? Just as importantly, why does each succeeding generation of practitioners ignore the insights of previous historians and then go on to create a set of new, even more fantastic, myths? Most importantly, how is it that so many sober, professional and sometimes even highly educated individuals get caught up in this? One suspects few individuals approach their professional and personal lives with the same degree of faith and credulity that they grant their martial arts school. Given the manifestly fictional nature of so many martial arts narratives, it is hard to understand this attitude as anything other than a willing suspicion of disbelief. Over the last few months I have been running a short, informal, series of posts asking how individuals can continue to espouse a position that is clearly at odds with a more mundane world view. We have looked at a variety of approaches to this problem including market driven branding, social discourses stemming from competing folk histories and elite constructed invented traditions, and most recently the idea of hyper-real religions (or faith communities consciously founded on a fictional story). The current essay seeks to expand this conversation by examining the role of political ideology in the construction and perpetuation of these mythic systems. In 2007 Prof. Douglas Wile addressed this question in an important article titled “Taijiquan & Daoism from Religion to Martial Art & Martial Art to Religion” in the Journal of Asian Martial Arts (Volume 16 Number 4). This study is remarkable both for the candid nature of Wile’s assessment of much of the Chinese language academic (or pseudo-scholarly) literature on Taiji, and the ferocity with which he demolishes the historical claims of a number of important styles. In it he divides the literature between a relatively small number of authors who attempt to build an intellectually honest understanding of the origin of Taiji, and the majority view which is instead dedicated to constructing the art as an entirely Daoist practice with literally divine origins in Zhang Sanfeng. He then asks why this later set of arguments, based only on unsupported suppositions and historical fantasy, has come to dominate the popular discussion of Taiji in both China (and to a degree the West) in recent decades. This article certainly generated some discussion when it was first published. Wile did a great service to the Western martial studies community by both reviewing the existing Chinese language academic literature on Taiji and asking some very critical questions about what was going on within its intellectual milieu that legitimate historical research could so easily be displaced by wishful thinking and in some cases outright fraud. I would go so far as to say that this has been one of the most important articles written on the Chinese martial arts in the last two decades. His lively, at times impassioned, language make it a joy to read. In fact, I like the writing in this article so much that I intend to quote some of the more memorable sections bellow so that readers can get a sense of what they are missing. If you have not already read it, please make sure this one gets on your list. Given its intrinsic value I am surprised that we don’t see more discussion of this study. Recently I have been reading through a number of literature reviews for my own research and realized that this article is often conspicuous by its absence. I suspect that the problem may have something to do with the venue that it was published in. While it produced a number of very high quality studies over the years, professional academics seem wary of including publications from JAMA in their literature reviews. At the same time, the more involved nature of these papers distances them from a lot of the popular discussions of the martial arts that one sees on-line. Wile goes beyond much of the existing literature in his treatment of the origins of fiction in martial arts history by concluding that more than one explanation seems to be at work. One should always be a bit wary of simplistic, single-variable, models of complex social phenomenon. Even though much of his discussion focuses on the role of political ideology in shaping the Taiji debate, he acknowledges that the parameters of this discussion have changed over time. In some periods it has even been superseded by other concerns, most notably a genuine search for religious meaning and spiritual solutions to pressing social problems. Wile himself suggests no theoretical apparatus for understanding the role of religion in Chinese popular society, or predicting when either political or religious concerns will dominate the discussion of Taiji. Both modes of understanding are inextricably linked to the definition of society, and the switch from one model to another always seems to depend on exogenous developments. This suggests to me both that more research is needed to flesh out the complex relationship between ideological and religious currents within Chinese popular culture, and that the traditional martial arts may shed critical light on this puzzle. Still, some of his conclusions on what the great Taijiquan debate suggest about the state of popular spirituality in China today are remarkable and worth considering in greater depth. “The question of Taijiquan’s origins-and specifically whether they are Daoist or not- is no mere academic exercise but a major theater in China’s culture wars for nearly a century…The continued outpouring of fictional accounts of Taiji history in the 21st century may appear to be transparently political or commercial, but sometimes it can only be explained as the persistence of a cultural practice that refuses to conform to modern notions of “fact” and the search for a Chinese style of spirituality that retains faith in psychosomatic self-perfection and the possibility of embodied immortality.” (Wile p. 9-11). When did Taiji, a form of boxing that apparently originated in Chen Village, first manifest a close relationship with Daoism, and how did the Chinese state decide that it had a vested interest in the outcome of debates on its origins? 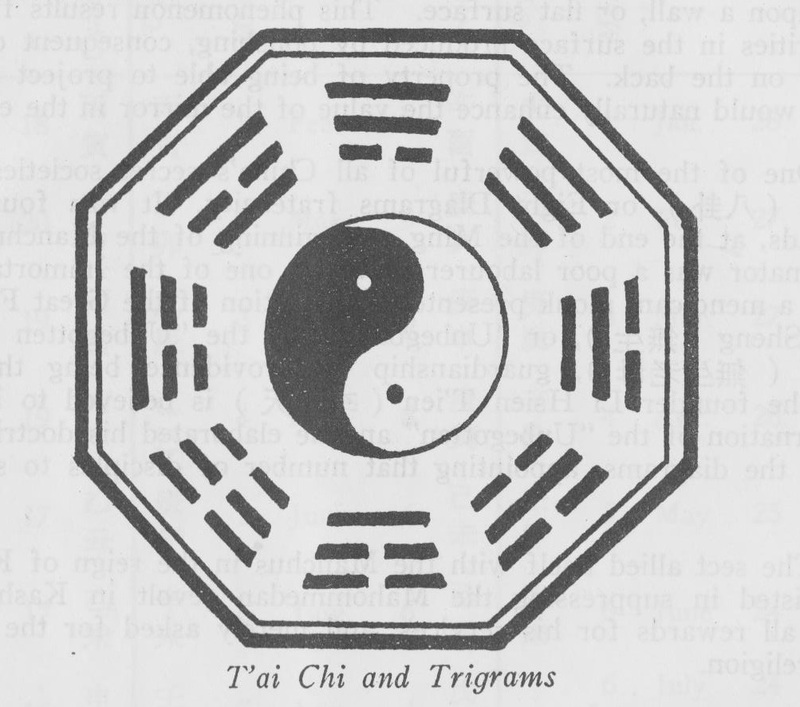 The earliest linkage between Taiji and Daoism appears on Li’s preface to the “Taiji Classics” which were previously discovered, copied and adopted by the Wu brothers. One version of this document noted the role of Zhang Sanfeng, a noted Daoist mystic, was the creator of Taiji (see Wile 1996). Zhang’s role in the creation of the “internal martial arts” was first suggested by the scholar and Ming loyalist Huang Zongxi in the opening years of the Qing dynasty. In the Epitaph for Wang Zhengnan he claimed that Zhang Sanfeng was the original creator of the so-called “internal school” of boxing which he defined in opposition to the better known (and in his opinion ultimately foreign) Shaolin method. This uniquely Chinese approach was created after the Daoist sage received a dream inspired by the God of War. Huang’s son Baijia was a student of Wang’s and recorded something of his master’s method in a text called Internal School Boxing Method. Wile notes that this work, while it shares an interest in soft-boxing with later Taiji methods, shows little resemblance to the modern “internal” styles. Nor does it display any awareness of the importance of internal training. In any event, hand written copies of the Taiji Classics or texts like the Epitaph for Wang Zhengnan did not circulate widely in the early 20th century. Instead we can thank Sun Lutang, who apparently relied on a nebulous and still undefined body of folklore, for declaring Taiji to be an “internal art” and publicly proclaiming Zhang Sanfeng as its founder. Sun’s work on Taiji went even further in attempting to draw substantive links between Taiji practice and Daoism. Wile notes that even the introductory chapters of his treatise on the subject read like an almost verbatim copy of any one of the numerous tracts on internal alchemy that circulated in the period. In fact, much of his thought, and that of subsequent authors, on the Daoist inspired nature of Taiji seems to have more in common with this literature than it does conventional boxing manuals. Sun Lutang’s work was the first (1919) commercially published work on Taiji, but many more followed in its wake. Wile notes that each of these followed Sun in linking the creation of Taiji to Zhang Sanfeng and seeing it as imbued with deep Daoist meaning. From a sectarian viewpoint these myths allowed members of the then dominant Yang family to distance themselves from the heritage of Chen Village by instead linking themselves with a practice that had a divine origin. The Daoist theory of Taiji’s origins monopolized discussions of the 1910s and 1920s. It was not until Tang Hao’s pioneering studies of the history of the Chinese martial arts in the early 1930s that it received a sustained and vigorous challenge in the public arena. Even then, Wile notes that the otherwise “revolutionary” and “modernizing” KMT, which was content to allow all sorts of traditional practices (including medicine) to fall by the wayside, seemed to promote and favor a Daoist view of Taiji through its official organs. It goes without saying that we don’t have as many martial arts manuals from the 17th and 18th centuries as modern students of martial studies would like. Nor does anything like Daoist internal alchemy appear to have dominated boxing in this early period. We have already seen that the Sinew Changing Classic was being promoted among certain martial artists under the auspiciousness of the Bodhidharma myth from at least the late Ming. Yet it is not until Chang Naizhou that we get a comprehensive and clearly stated alchemical theory of internal martial practice. Even the Taiji Classics do not directly quote Daoist texts. Instead they indulge in a great deal of textual borrowing from the more conservative Confucian literary tradition. Already by the end of the 19th century there seems to have been a political dimension to the perception of Daoism’s role in the martial arts. This would become more pronounced as the Republic era progressed. In time it would become the single most important defining factor in the great Taiji debate. Ironically some of the strongest institutions and voices supporting the Zhang Sanfeng/Daoist origins of Taiji came from the KMT backed martial arts establishment. 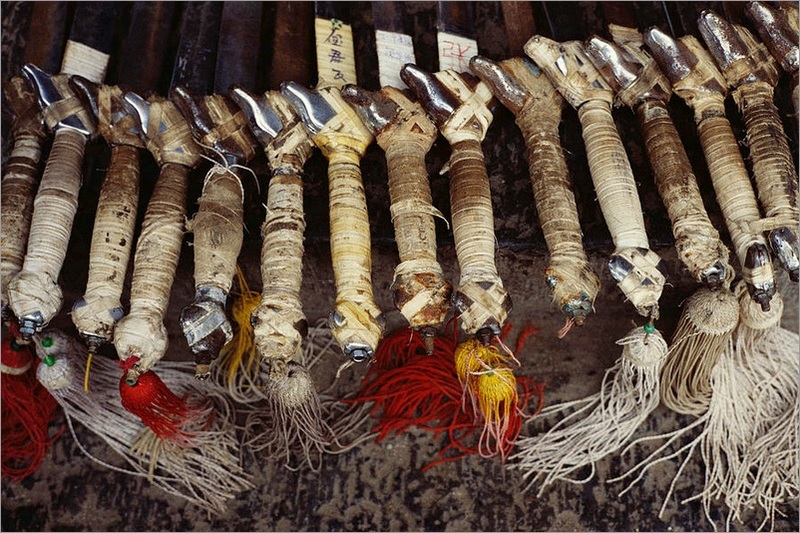 While still dedicated to the modernization and standardization of the traditional fighting arts, the Daoist origins of these practices became a critical element of the argument that they were in fact “national” in character and could be used to strengthen the people, both physical and spiritually. If the reformed martial arts were to be made to serve the national good, it was important to show that they stemmed from China’s ancient primordial past. The myth connecting Zhang Sanfeng and Daoist alchemy to the creation of Taiji, which was quickly establishing itself as the national art, served this purpose admirably. Of course not everyone was equally happy with this development. Regional masters in local marketplaces disliked the competition from the new national Guoshu networks as it threatened their livelihood. Yet they did not have much of a voice in elite debates over social reform or the nature of national identity. Instead it was leftist intellectuals, also interested in the role of physical culture in social reforms but opposed to the KMT and its conservative policies, who voiced the loudest concerns about the links between Daoism and the traditional martial arts. Rather than tying these practices to a set of myths and images that were invented and tightly controlled by the ruling elite, these reformers wanted to return the martial arts to “the masses” as a powerful tool of self-strengthening and reform. The most important voice in this camp was none other than Tang Hao, the father of modern Chinese martial studies. Tang was fanatically dedicated to the promotion of the traditional Chinese martial arts. He did pioneering historical and field research on a number of styles (including Taiji) and even worked for the Central Guoshu Institute for a short period of time. Tang was also an outspoken critic of the government’s social policies and was arrested on suspicion of being a member of the Communist party on multiple occasions. It does not appear to me that Tang Hao’s leftist ideology warped the broad outlines of his historical conclusions. In truth the Chinese martial arts have always been an aspect of popular culture, and thus associated with “the masses.” Their appropriation by elites using invented traditions to shape them for their own nationalist projects was a rather late development. In the post-1949 period the Taiji debate took on an even more pronounced Cold War flavor. Tang Hao’s research became the basis of all discussions of martial arts on the Communist controlled mainland. Likewise the culturally conservative and reactionary elements of the martial arts community that fled to Taiwan and Hong Kong continued to promote the Zhang Sanfeng theory. Their adherence to this position became more strident (and in a sense understandable) as the Cultural Revolution sought to rewrite Chinese social and cultural identity at a granular level. Wile notes that this bifurcation of the discussion had a huge impact on how Taiji’s relationship with Chinese culture came to be seen in more conservative circles, as well as how the art was introduced to the west. Indeed, some of the developments of this period continue to suggest vexing questions for western students of Taiji Quan today. “The only expressed opposition to Mainland officialism during the 1950s through the 1970s came from cultural conservatives in Taiwan, Hong Kong and the overseas Chinese community. The formula of most early 20th century taiji ideologues was patriotism, popularization, science, and mystification. The Communists eliminated only the mystification, using modern scholarship and science to explain taiji’s history, theory, and practice. Myth deprived the people of their proud history, and lineage monopolized the knowledge that could benefit the whole nation. The psychosomatic state of relaxation in action induced by taiji practice is not described in terms of spiritual attainment but medicine and psychology. Conservative exponents of taiji believed that taiji’s principles were consistent with western science, but western science was too crude to explain all of taijiquan. 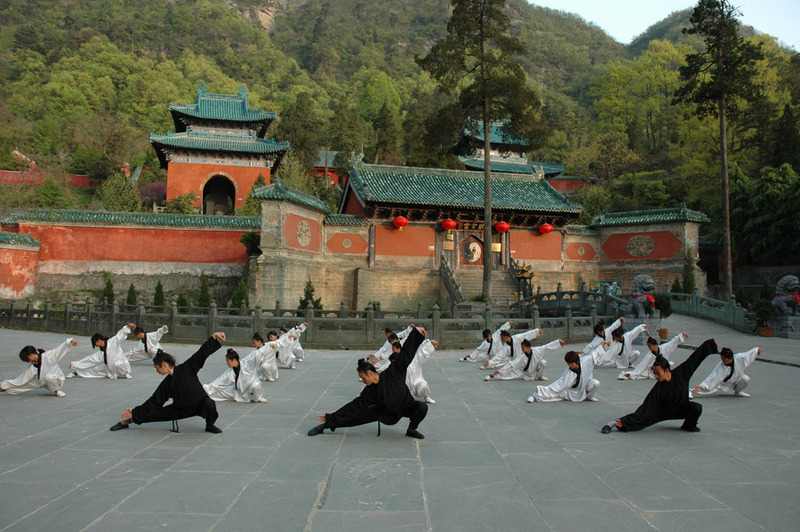 Taiji being demonstrated at the famous Wudang Temple, spiritual home of the Taoist arts. Notice they wear the long hair of Taoist Adepts. Source: Wikimedia. Throughout this article Wile illustrates how the contours of the great Taiji debate came to reflect the ideological struggle that dominated so much of China’s 20th century history. Even the opinions of well-informed practitioners and scholars seem to have been bent by their personal position relative to this larger social conflict. Wile’s brief discussion of Zheng Manqing’s forceful endorsement of the Zhang Sanfeng myth at the height of the Cultural Revolution (where he had said very little about it as a younger martial artists in the 1930s) is a great case in point. Zheng was a very conservative scholar in terms of his approach to Confucianism and the classical texts. He strongly disliked the mysticism of neo-Confucianism, so one would not necessarily expect to see someone like him forcefully endorsing what he would have known to be folklore. Yet Wile argues that for a range of conservative individuals such as Zheng, Daoism had become an expression, or a master symbol, of Chinese culture. Zheng’s actual argument was quite clear. Taijiquan’s status as China’s primer martial art (and most visible cultural export) was inseparable from its Daoist trappings. To lose hold of this cultural knowledge at a time when so much else was being lost in the Cultural Revolution would be disastrous for the nation. Zheng’s fears about the disappearance of interest in the connections between traditional Chinese culture and Taiji seem to have been premature. While a few western students have explored the combat potential of Taiji, most individuals seem to be attracted to the art precisely because of its association with traditional Chinese medicine, philosophy and alternate modes of spirituality. The situation in Mainland China is now drastically different from what it was during the 1970s. Following the end of the Cultural Revolution there was a massive outpouring of interest in the martial arts. Some of this enthusiasm was channeled into officially sponsored Wushu channels, but much of it flowed into the traditional arts, including the many styles of Taijiquan. Masters reemerged and public classes became a common sight in parks throughout the country. State media outlets hopped on the bandwagon and began to aggressively market martial arts material because they were popular with audiences and perceived as politically safe by the censors. Once those media operations were privatized in the 1990s they had an even stronger incentive to feed the rapidly growing market for Taiji manuals, documentaries, magazines, historical books and entertainment. Throughout the last half of his article, Wile repeatedly returns to the question of manufactured spirituality within the modern Taiji movement. He does not appear to doubt the convictions of those who he refers to as “neo-Zhang Sanfeng cultists.” He even goes so far as to argue that Taiji practice is in some ways ideally suited to provide students with an understanding of Daoist ideas and ritual practices. While it is clearly not “Daoist” (in a strictly constructed sense) in its genetic origins, he does conclude that Daoist thought offers a good toolbox for interpreting modern Taijiquan practice. Yet the emergence of these alternate spiritual practices has done nothing to aid the job of historical or cultural scholars. It has added yet another layer of elaborate myths that need to be carefully deconstructed by another generation of students interested in the origins of the art. Wile never directly employs the term, but what he describes seems like a good fit for the idea of “hyper-real religions” introduced in our recent discussion of the Bodhidharma myth. Still, even as the pendulum appears to swing towards a more “religious” interpretation of the Taiji debate in the current era, the question of political ideology never fully disappears. It continues to loom dangerously in the background. Wile’s discussion of the interplay between religious and political interpretations of this debate is important precisely because it reminds us that there are multiple dimensions that people construct an identity along within any popular culture system. Of course it is also fascinating to note the degree to which these various poles of identity lay congruent with, rather than cross-cutting, each other. How then should we understand the reemergence of a spiritual discourse in the traditional Chinese martial arts today? One obvious reading of the explosion of Kung Fu and Qingong Fever in the 1980s and 1990s was that these were the spasms of social groups being left behind by globalization. In the wake of a damaging encounter with global markets they sought to turn their backs on modernity, retreating into an inward looking, or fundamentalist, definition of identity. One does not have to look too far in the Chinese martial studies literature to encounter exactly that critique of these movements. It is usually present in the many anthropological studies that provide ethnographic examinations of boxing among “marginal” individuals. See the doctoral dissertation of Daniel Amos, Marginality and the Heroes Art: Martial Artists in Hong Kong and Guangzhou, for a pioneering and well developed example of this view. Wile warns readers against a too easy acceptance of the assumption that any new religious movement must by definition be marginal or poorly suited to modernity. Invoking the idea of the “protestant work ethic” and its role in the rise of western capitalism, he notes that there are interesting possibilities embedded within Taiji’s spiritual movements that cultural scholars should consider. “In the end, all of this [modern Chinese pseudo-scholarship] can teach us nothing about the true origins of taijiquan, but a great deal about the contemporary intellectual milieu in China….Since it is difficult to use capitalist discourse to undermine a “communist” regime that is privatizing everything in sight, and democracy is not perceived as a sure cure for poverty and corruption, it seems that only a religious movement can rally sufficient passion an numbers to challenge the regime. The Taipings and Boxers are good examples from not so distant history, and the Zhang Sanfeng cult shows that Falun Dafa (lit. “Great Law of the Wheel of Law”; also, Falun Gong) is not an isolated case. Paralleling the emergence of ethnic and provincial localism, defining “Chineseness” is no longer exclusively a monopoly of the state, but can be contested by special interests. Wile introduces these ideas near the conclusion of his paper and he does not have sufficient space to fully develop them. This is a great disappointment. Given the depth of the literature on marginality and its connection to the Chinese martial arts I am hesitant to simply discard its findings. Still, Wile suggests exciting avenues for future research. In an era when many traditional Chinese arts are struggling to survive, a few are doing relatively well. Taiji clearly stands out at the head of this pack. To what degree is it succeeding because of its status as a hyper-real religion, one that is uniquely congruent with the spiritual demands of the current era? And can we apply these same political and religious insights to other arts, such as those which dominate southern China and Pearl River Delta? Those questions will have to wait for further exploration in future essays. If you enjoyed this post you might also want to read: Understanding Opium Use among Southern Chinese Martial Artists, 1890-1949. As a sinologist with a EU doctorate myself, I highly recommend and value Prof. Wile’s research papers on the official writings in Cinese history. However, there is also a large body of unofficial written sources, which are not researched well so far and need much more work. Therefore, I’d like to suggest once more the Hkk based Journal of Chinese Martial Arts, Winter 2010, Issue 2, Wong Yuen-Ming: Taijiquan: Heavenly Pattern Boxing, p. 28 – 37. The author tries to work on some of these unoffical sources, and if there is more to come, the person of Zhang Sanfeng may appear in yet another light. Thanks for the reference! I will see if I can get a hold of the right back-issue. Hi, I am vey interested in converting your newsletter to a podcast. I thoroughly enjoy it. It is ine of the only martial newsletters that i dedicate time to read. Sometimes i have read them to listen to in my car and thought i could just take the extra step and post it up. All the credit would be to you and to the credits you identify. I could also just add the pictures that you provide as part of it too. I dont expect any payment in return nor would i take credit for the newletter. I can share with my students and of course identify your webiste as the source. Drop me an email and we can discuss your idea further. The ‘bending’ of CMA history (generally speaking) is part and parcel of how SInology is sometimes debated when applied with a “western’ frame of reference. The Zhang Sanfeng mythic and hagiographic endeavour is obfuscation at best, in the light that there were at least 3 such ‘patron saints’ of different eras in the public domain. Additionally, all the personages affiliated, or who learned from Chen or Yang had no Zhang Sanfeng points of contact. They were all Chen or Yang surnamed (even Wu at times) but then we need to interject the forgotton Li family, no longer affiliated with the Chenjiagou folk background. It is realized that for Yang, Wu, Sun, etc to be as they are today, they had to change the Chen system somehow to secure their own familial martial heritage that now carries their name.